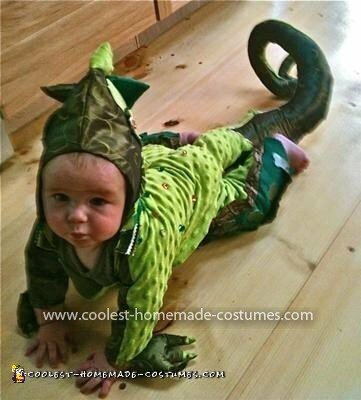 My baby boy, Winter, was eight months old just before Halloween and he had begun to crawl. My husband commented that he walked a lot like an iguana, and he really did – one splayed little hand at a time. 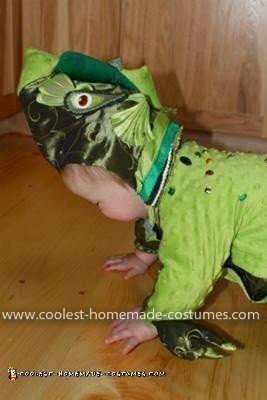 The Baby Dragon costume hatched. He grew out of this costume three times in a month and more panels needed to be added to the sides and legs before trick-or-treat night. Also, I had to make it much easier to get in and out of with velcro and a wide neck so little Winter could handle being put into it! (It also helped to put it on him several times before Halloween – the screams of dismay eventually became screams of delight…). 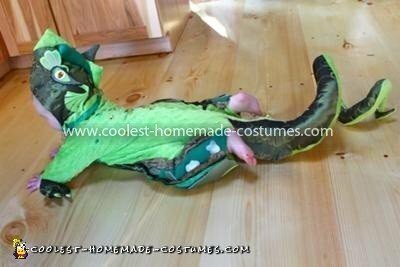 Made from fabric scraps, an old green bathing suit, a pleather purse, velcro, hot glue and bedazzling jewels, this is one little dragon that may not breathe fire, but he certainly will melt your heart! The Lions Club had a kids party, and Winter went with his older cousins – he stole the show by crawling around after a big orange balloon. One woman walked in, glanced his way and shrieked! She thought he was a live baby alligator! (Of course, it was kinda dark, and she was a little ridiculous…we live in Maine… c’mon… alligator?). 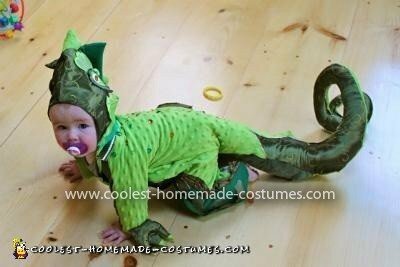 This Baby Dragon Costume is really much more hysterical in motion – check out the video of the Coolest Baby Dragon!